Dr. James H. Walthall provides comprehensive eye exams, complete contact lens services, Lasik co-management, and glaucoma management, and is an expert in corneal refractive therapy. Routinely praised by his patients, Dr. Walthall has the education and experience required for successful patient outcomes. 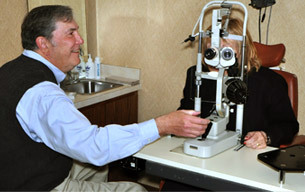 He enjoys having his patients see better by using the latest diagnostic tools available. Dr. Walthall is Board Certified in the use of diagnostic and therapeutic pharmaceuticals. Dr. Walthall has earned the respect of thousands of patients who value his dedication to providing excellent service. Unlike corporate optometrists, you can be assured that Dr. Walthall will be there for you year after year you — will not be seeing a different doctor at every visit. That is the main reason Dr. Walthall was drawn to the field. He wanted a career where he could make positive changes to people’s lives. After graduating with a B.S. in Chemistry from Virginia Commonwealth University, Dr. Walthall received a B.S. in Biology and his Doctor of Optometry degree from the Pennsylvania College of Optometry in 1984. He immediately began his private practice career in Annandale, right down the street from his current location. Having practiced optometric care in Annandale, Virginia for over 30 years, Dr. Walthall has all the education and experience required for successful patient outcomes.